Fresh herbs are a must for any kitchen garden. This 3-pack for the Click & Grow indoor herb planter comes with three little pods, each containing an herb that is free of GMOs, pesticides, fungicides, insecticides, plant hormones, and all other suspicious substances. It’s nature at its purest, times three. Dimensions: 8.3" x 2.6" x 2.6"
If you love cooking with fresh herbs, Click & Grow will let you grow your own all year long—even if you don’t have a green thumb or space for a garden. 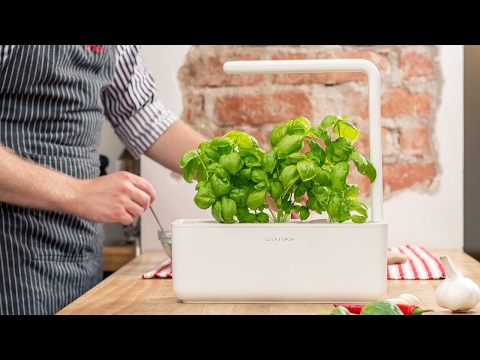 This low-profile herb planter brings “kitchen farming” indoors with no guesswork. Founder Mattias Lepp was committed to using sustainable approaches to planting. He based Click & Grow on biomimicry—which imitates processes found in nature—and used NASA-inspired technology to guarantee results. 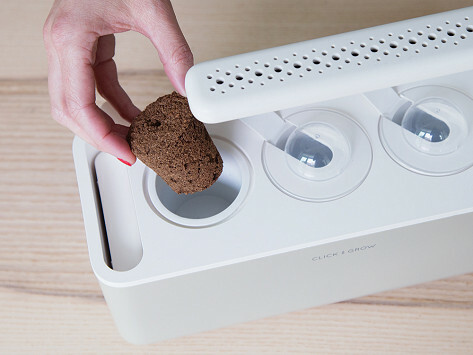 Click & Grow comes with an adjustable light source, a monitoring system, and a new growth medium called SmartSoil. It contains a year’s worth of nutrients, which are distributed evenly along with water and oxygen. Sensors constantly monitor water levels and signal when your herbs need a drink. With absolutely no guesswork, you’ll have sprouts in just a few days. The Click & Grow herb planter makes the perfect gift for anyone who loves to garden—without any of the work.